SERVPRO of Douglas County recognizes these and the countless other first responders in our communities for keeping our communities safe. 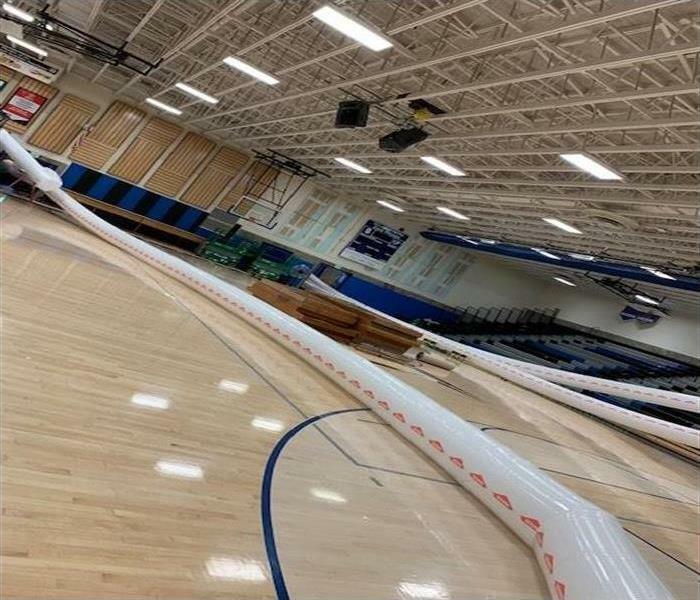 After an unexpected snow storm left our town with up to 15" of snow, the subsequent snow melt created leaks inside of our local high school gymnasium. With a quick response, SERVPRO of Douglas County Extreme Response Team was able to shovel the remaining snow off of the roof to prevent any further damage, and begin our drying process, bringing in huge generators as there was still no power available. Our SERVPRO of Douglas County Extreme Response Team is ready to help anywhere in the United States at any given moment. Our Extreme Response Team helps with commercial, storm, fire and water losses, along with large bio cleaning jobs. Our large, 53' trailers are loaded and ready to respond at any given moment to have your commercial property operating under normal procedures ASAP. After a large storm flooded the area, the furniture store suffered from major water damage. With a quick response, SERVPRO of Douglas County Extreme Response Team was able to salvage the furniture and achieve a complete dry out to the building and contents. Our Extreme Response Team was able to work in certain areas of the store, without disrupting daily business throughout the facility. Once your home or business is damaged by a fire, your top priority is getting your property cleaned and repaired. In many cases, this desire leads people to pursue DIY cleanup projects. If this were your planned method, you should reconsider this course of action. Can you do all of this yourself? 1. Water Removal: Standing water left behind by the fire extinguishing efforts of the local fire department have several important ramifications. The resulting water damage can affect furniture, electronics, clothing, drywall, ceilings, flooring, and more. Water removal must be done quickly. SERVPRO of Douglas County utilizes water pumps, wet-vacs, high-velocity fans and dehumidifiers to extract the water and moisture quickly, thereby mitigating the damage. 2. Smoke Damage: The smoke damage that results from a fire can be quite substantive. In fact, the smoke left behind can become embedded in your furniture, flooring, carpets, and walls. If left unaddressed, this can remain in your property for years. Soot, another by-product of specific fires, needs special attention for proper clean up to avoid staining of walls and furniture. Effectively removing smoke necessitates the use of professional procedures and products SERVPRO of Douglas County crews have in their arsenal. 3. Salvageable Goods: In many cases, homeowners who seek to complete the remediation process on their own will throw away items that are salvageable. Don't make this mistake. Instead, allow SERVPRO of Douglas County to assist you with this aspect of the restoration process. We will assess, inspect and issue you a Contents Claim Inventory Service form--CCIS. This inventories affected household items and classifies them into non-salvageable, salvageable or questionable lists. Items can be containerized and cleaned at our facility. 4. Time Efficiency: If you attempt to complete the fire restoration process without professional assistance, the project will take a lot of time and probably lack positive results. However, hiring SERVPRO of Douglas County to put your home back in a healthy condition after fire damage enables you to feel confident in the restoration. Consider the effort, equipment, and training involved in successfully restoring your home to its pre-fire condition. Our owner, Tim Clark, plowing our office parking lot. 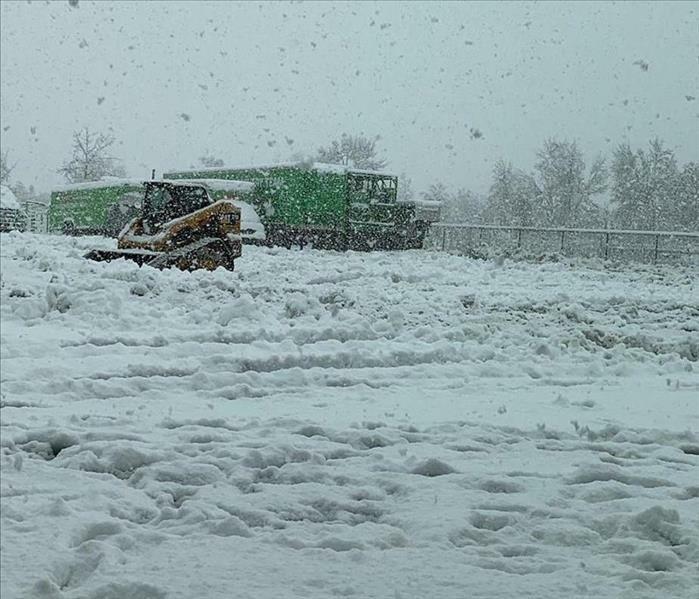 Work at SERVPRO of Douglas County didn't stop. Our owners were plowing our parking lot so that our crews and vehicles could still get out to help our customers, generators were delivered to large commercial buildings so that they could stay open to help our community, and numerous roofs were tarped after an even bigger amount of trees were removed from structures. SERVPRO of Douglas County Extreme Response Team was called in for emergency services due to flooding from Hurricane Harvey. This 300-acre facility was flooded with 50,000 square feet of water damage. SERVPRO of Douglas County Extreme Response Team was able to mitigate damages and help get the facility back into production as quickly as possible. Our SERVPRO of Douglas County Extreme Response Team is ready to help anywhere in the United States at any given moment. Our Extreme Response Team helps with commercial, storm, fire and water losses, along with large bio cleaning jobs. Our large, 53' trailers are loaded and ready to respond at any given moment to have your commercial property operating under normal procedures ASAP. If your commercial property suffers from any type of damage, call SERVPRO of Douglas County Extreme Response Team 541-459-3987. When your home or business suffers a water damage, understanding what type of water you are dealing with is critical to ensuring proper cleanup. There are three types of water. Clean water is water from a broken pipe, or other water source; rainwater is also considered clean. The term gray water is used to classify slightly contaminated water. Clean water becomes gray water when it is left untreated allowing bacteria and other contaminants to begin growing, making the water hazardous. Black water is highly contaminated and filled with fungi, bacteria, chemicals and more. Black water is typically caused by sewage damage, flooding or any type of natural disaster. Black water should always be handled by trained professionals. 3/2/2019 - Is This BLACK MOLD?